Here is a type of article you will not find in today's modeling magazines; it is an in-depth look at the state of Russia's space program in the late 1960s. In 1968, the Cold War was in full swing, and recently constructed survival shelters were still stocked with food, water, clothing, and medicine in case some crazed general in Russia decided to push that would launch a barrage of ICBMs over the North Pole and into the USA. President Kennedy's challenge to send a man to the moon and safely return him was a year away from reality, and the Space Race was revealing how different design and execution strategies can be toward accomplishing the same goal of manned space flight. Maybe it is cultural bias, but I have always believed that American rocket design looked much more eloquent - even beautiful - than the Russian efforts. Could it be a result in the vastly alternative mindsets of Capitalism versus Socialism/Communism, where the former had as part of its nature a desire to appeal to consumers who had a choice in what they buy as opposed to the latter where consumers had to accept what the ruling class offered. Functionality was the only requirement. Communism produced ugly, black cars while Capitalism was offering vast choices of colors and styles. Members of the oligarchy imported their cars. The Worker's Paradise thing never did fool the proletariat. 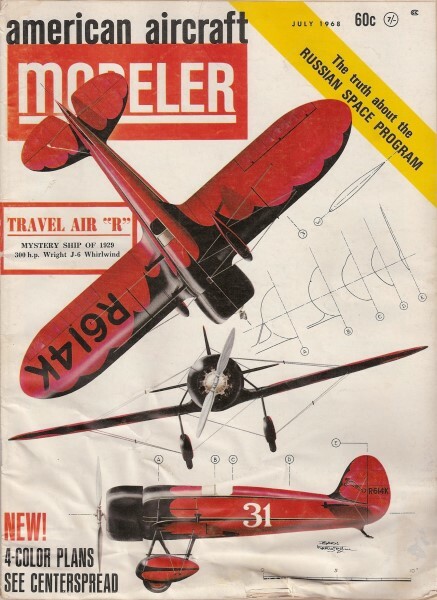 This article from the July 1968 edition of American Aircraft modeler is an excellent illustration of what I mean. 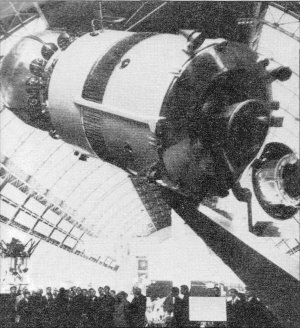 The complete Vostok spacecraft as it was displayed in Moscow in May 1965. Note vernier-thruster nozzles and top-stage engine nozzle. Shown here in orbital configuration, it may be compared to drawing. Vostok command module sphere on display in Moscow shows dummy cosmonaut in ejection seat, and hatch used for entrance and ejection. Open hatch, left, to parachute storage - with the risers attached. Standard Soviet space carrier rocket with Vostok spacecraft. Strap-on boosters and hammerhead configuration of sustainer core are visible. The unfaired hatch in nose shroud is for cosmonaut entry-egress. Vostok and its carrier rocket before launch. Hold-down arms grasp forward booster attach points. Two umbilical towers swing back on lift-off. The vans are rail cars. Base of carrier rests below launch pad. Interior of Voskhod 1 cabin shows viewport between the feet of the command pilot and simple instrument panel. Cabin heavily padded. Quite a contrast to the instrument and control panels of the U. S. Gemini. Umbilical connector and shroud connecting the Vostok command module to service module positioned so as not to penetrate ablative heat shield. The 1:16 model on display London Kensington Science Museum. RD-107 rocket engine has four main thrust chambers and two vernier chambers, supplied with Lox and kerosene by a single turbo-pump. The main chamber at left was cut away to show internal features. Top stage of standard carrier rocket as displayed at Paris Air Show in 1961. Basic top stage was added to sustainer-booster vehicle in 1959-1960 to raise the orbital capability to more than 10,000 lbs. Capability at that date was impressive. Arrangement of the 20 main thrust chambers of the standard Soviet space carrier rocket are clearly shown here, as it was prepared for display at Paris Air Show. Rocket is robustly constructed for handling and erection. EXCEPT for the obvious, well-documented results of the Soviet Union's space program in the past decade, there has been a shroud of secrecy around the actual vehicles, techniques, and equipment used by the Soviets to accomplish the numerous "firsts" in astronautics. Tass, the So vie news agency has never been reticent about announcing every Soviet space achievement as it has occurred, and Sovfoto has released numerous pictures of the Sputniks, Kosmos, Luniks. and other satellites and space probes. As a result of this secrecy, a tremendous amount of speculation about the Soviet space program has been carried out in Europe and the United States. Some Soviet space watchers, myself included, have continued to keep a quiet archive, awaiting the day when enough information became available to piece together a logical, unemotional, solidly based historical story of the Soviet space program. In 1967, the year of the 50th Anniversary of the October Revolution and the 10th Anniversary of the launching of Sputnik I, this shroud of secrecy was lifted by the Soviets. As of this writing, the shroud is almost completely gone, allowing us to determine exactly how the Soviets did it. So much data is now being released so rapidly that it is quite difficult to keep up with it all. What stands revealed is a space program characterized by decades of supporting re­search and development. long-term plan­ning, constantly increasing support, and excellent engineering. This is confirmed by the unveiling of the standard Soviet space launch vehicle ­ "carrier rocket," in their terminology - at the Paris Air Show held at le Bourget on May 26, 1967. At the same time, the Soviets revealed details of the rocket engines used to power their vehicles. This has been followed in 1968 by additional photographic and motion picture film releases from Tass and Sovfoto, as well as from the Czech news agency (CTK). This evidence, in turn, confirms the fact that the Soviets developed and used a large launch vehicle during the first decade of the Space Age. The standard Soviet space launch vehicle is undoubtedly the original T-3 ICBM. This conjecture is supported by the early 1957 flight history of the T-3 ICBM as announced by the Soviets and revealed by our long-range Turkish-based tracking radars. Briefly, the history of the Soviet space program goes back to 1903, the year of publication of the initial works of Kon­stantin E. Tsiolkovski dealing with the use of multi-staged rocket-propelled space vehicles. In 1919, the first Soviet rocket research laboratory, the Leningrad Gas Dynamics Laboratory (LENGIRD) was established. The Soviets were flying their first liquid-propellant sounding rockets in the 1930's. They received a windfall (as we did) in 1945 with the capture of the German rocket research center at Peene­munde, the German A4 (V -2) assembly factory, Mittelwerk, near Nordhausen, and several hundred German A4 rocket produc­tion and test engineers. The USA got von Braun's design and development team. By 1949, most of these German rocket engineers had been returned to Germany by the Soviets, who had, in the meantime, cranked-up the A4 production line again. Several improved versions of the A4 were developed by the Soviets. But, by and large, their rocket development work re­mained their own; they learned from the Germans and then modified their own developments from this teaching. We can lay to rest forever the fallacy that the Soviet space program was German in origin and execution. Facts no longer will support this notion. Both the Soviet Union and the United States started serious design studies of a nuclear-tipped ICBM at about the same time. The USA demurred from building the very large rocket vehicle that would have been required to carry the bulky and heavy nuclear and thermonuclear war­heads of 1950-1952. The Soviets went ahead and built the kind of big rocket it would take to deliver such a heavy warhead over intercontinental ranges. We waited until the "thermonuclear breakthrough" of 1953 permitted smaller TN warheads and there­fore smaller ICBM's of the size of the Atlas SM-65. By 1957, the Soviets found themselves with a very large rocket capable of carrying very heavy payloads over both ICBM range and into orbit. Based on the data filed with the FAI in Paris for the Soviet manned flight rec­ords, we believed that the Soviets had developed some very large liquid propel­lant rocket engines. The Soviet data sub­mitted to FAI clearly states that the launch vehicle was powered by six rocket engines. 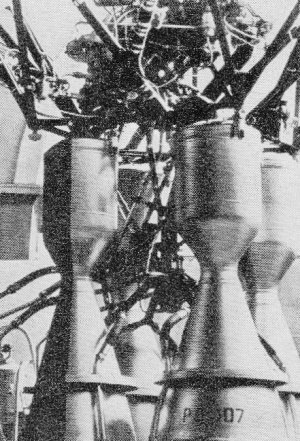 To achieve the payload orbiting capability announced by the Soviets, this meant that the rocket engines would have to be large. In US terminology, a rocket engine is a single combustion chamber with a single turbo-pump supplying its propellants. There have been some exceptions to this, namely the RMI XLR-11 four-chambered "Black Betsy" that powered the Bell X-1, the Convair MX-774, the Douglas D-558-2, and the early version of the X-15. But, to the Soviet engineers, a rocket engine was one or more combustion chambers linked together to be supplied by a single turbo pump. This follows the same logic that terms a V8 automobile engine as an engine, although it may have eight separately acting combustion cylinders; a V8 automobile is not powered by eight separate engines, by definition. Four main thrust chambers and two vernier chambers with a single turbo pump in each of four strap-on boosters. This is known as the RD-I07 rocket engine. Four main thrust chambers and four vernier chambers with a single turbo pump in the central sustainer core, known as the RD-108 rocket engine. A single thrust chamber and four vernier chambers with a single turbo-pump in the top stage. This engine designation is unknown, but may be the RD-119. Totals: four boosters, one sustainer, one top stage. Six rocket engines in all, Soviet style, and six turbo-pumps. In operation, the Soviet carrier rocket is a 1% stage vehicle with a series top stage. As we will see, the top series stage was added to the basic booster as the program progressed. According to Space Business Daily, the Soviets refer to this carrier rocket as the RD-107, the same designation as the booster engines. At lift-off, it operates as a parallel-staged vehicle. The four RD-107 engines of the boosters and the RD-108 of the sustainer core are ignited at the same time. This is a total of 20 main thrust chambers and 12 vernier chambers, providing an estimated total takeoff thrust of 950,000 lbs., increasing to 1,150,000 in vacuum. At an undisclosed time and al­titude, the four strap-on boosters separate from the sustainer core, probably by having explosive bolts sever the fore and aft attachments. The hammerheaded sustainer core continues thrusting with its RD-108 engine producing 228,480 lbs. of thrust. In due course - thrust duration unknown ­ the sustainer core propellant tanks are emptied, and the RD-108 shuts down. If the vehicle is carrying its top stage, the single-chambered top stage engine then lights-off with "fire-in-the-hole" technique, and explosive bolts separate the top stage from the interstage truss structure. Soviet rocket technology must certainly be applauded if their engineers can man­age to ignite simultaneously 32 thrust chambers at launch. The ignition technique is very similar to that of the German A4, as shown by released motion pictures of the start sequence. At the ignition signal, propellant valves open permitting the propellants - liquid oxygen and kerosene ­ to flow to all combustion chambers by a combination of gravity feed and tank pressurization. We don't know whether ignition is accomplished by pyrotechnic igniters in each chamber or by use of "hypergolic leads" - slugs of propellants introduced into the engine plumbing between tanks and chamber injectors so that when they initially come into contact after the start signal, they start a fire simply by contact with each other. Thus, in this "preliminary stage," a very low-thrust combustion process gets ignition going in all 32 thrust chambers. Using either instruments to detect com­bustion in all chambers or eyeball inspe­tion through periscopes from the block­house, the launch crew has a few seconds to determine if all chambers are lit off satisfactorily. If everything is well, the "main stage" signal is sent, starting the turbo pumps. Thrust in all chambers then rises rapidly to some 950,000 lbs. total because the propellants are being driven into the combustion chambers by the turbo pumps. Once thrust has risen to the correct level, four launcher arms swing back from their hold-down attachment points at the forward booster attachments, leaving the vehicle free to lift off at an acceleration of about 1.3 gees, which is nearly optimum. Unlike our paper-thin Atlas vehicle which also uses a modified 1%-stage principle - jetissoning only two outboard booster engines, however, instead of engines and tanks - the Soviet carrier rocket is built very solidly. While the vehicle was being assembled at Paris, technicians walked up and down all over it. It was lifted and placed on its railway car erector by two cranes which picked it up and the forward and aft booster attachment points. 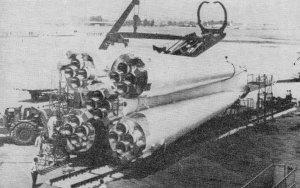 By using the strap-on booster concept with parallel staging, the Soviets were able to make a much shorter vehicle than would have been possible with series staging, and the carrier rocket is therefore a much stiffer vehicle than our smaller Atlas. There is also evidence that Soviet engi­neers paid a great deal of attention to aero­dynamics in their design. This sustainer-booster combination is undoubtedly the first-generation Soviet ICBM, often termed the T-3 and also called the M-108, although the latter designation may have referred only to an earlier version of the RD-107 rocket engine. As such, the sustainer-booster combination alone launched the first three Sputniks without a top stage. 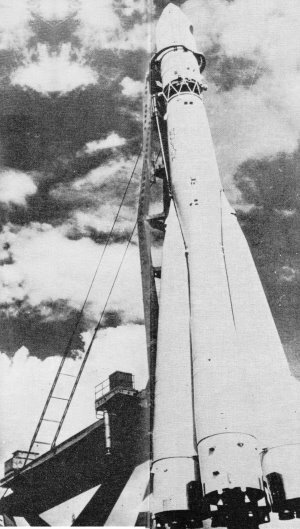 Soviet photos have been released showing the launching of Sputnik III with no top stage and no interstage support trusses. Another photo has been released showing a top stage and interstage truss structure with the caption, "Launch­ing of the Soviet pioneer manmade earth satellite." Therefore, the exact configura­tion of the launch vehicle for the first three Sputniks is, at this time, uncon­firmed, but the standard Soviet space car­rier rocket was indeed used to launch the Sputniks. Although the spherical Sputnik I was only 24" in diameter and weighed 184 lbs., it is not generally known that the Soviets orbited a total of some 8,000 lbs. on the first shot. Sputnik II weighed in at 1,120 lbs. with the dog Laika aboard, and again some 8,000 lbs. were orbited. Sputnik II was a bright object in the heavens, and I watched it go overhead many times. Sputnik II was photographed from Cape Canaveral, and RCA Service, Inc. estimated its length between 74 and 84 ft. The Royal Aircraft Establishment in England estimated from tracking data that the entire Sputnik II vehicle was 7.6 ft. in diameter and 65.6 ft. long. The total length of the carrier rocket sustainer core plus Sputnik II payload shroud is actually between 95 and 110 ft. long (depending upon whether or not the top stage structure and interstage trusses were really used), which is very close to the photo-based estimates of 1958. The first three Sputniks were therefore orbited using only the booster-sustainer configuration without any top stage. With Sputnik I, the rocket was operating far below its maximum payload-carrying capability. Even with the 2926-lb. Sputnik III, the vehicle was operating far below the 3087-lb. orbital capability of the booster, a figure recently revealed by Soviet pro­fessor G. V. Petrovich. In 1959-1960, the Soviets added the top stage to the RD-I07, and this was first tested on the launching of Luna I on January 2, 1959. This, then, was the complete 2½-stage booster that was eventually to launch the manned Vostoks. Petrovich an­nounced recently that the orbital capability of this booster was 10,143 lbs., and this was very close to the weight of Spacecraft I, launched May 15, 1960, which put an unmanned Vostok into orbit for the first time. The Soviets did not go at their manned orbital program lightly. There is absolutely no substantiation at this time to the persistent rumor that the Soviets lost one or more cosmonauts in the Vostok program. When they finally did lose a man, Komarov, in the first Soyuz flight, they did not try to hide the fact. They even went to great lengths in the unmanned Vostok test program to keep the West from believing that they had a cosmonaut in orbit; for the test of the communications in one of the unmanned flights, they deliberately used a recording of a choral group singing folk songs rather than the recorded voice of a single man. The Soviets do have a sense of humor, because they have admitted with chuckles that they also thought that this chorus from space would cause a bit of confusion among Western listeners! They also used their most reliable orbital weight-lifter as the launch vehicle, the standard carrier rocket. By the time they orbited the first unmanned Vostok in May 1960, they had had at least six tests of the vehicle as an ICBM (probably more), three orbital Sputnik shots, and three lunar shots. Their Vostok program was not without problems, however. Technology is technology, and there are no infallible super-engineers. They lost Spacecraft I, which is still going around in orbit as an unmanned Vostok. Spacecraft III, another unmanned Vostok precursor flight, burned up on re-entry. However, by the time their carrier rocket was "man rated," at the time of the first manned flight, the Soviets had had at least 18 space launches (that we know of) with the carrier rocket, two of which failed (that we know of). Undoubtedly, there were more flights of the vehicle than that, some of them being the Pacific test shots that were run during that time period. Therefore, the Soviets had a man-rated launch vehicle of very high reliability by the time Yuri Gagarin climbed aboard and rode into history once around the world on April 12, 1961. Having available the large standard carrier rocket, the Soviets were not as limited in the weight of their manned spacecraft as was NASA with the Mercury spacecraft lofted by the Atlas-D. The nominal or­bital weight of the Vostok spacecraft, in­. eluding pilot, is given by the Soviets as 4725 kilograms (10,422.5 lbs.) . Therefore, they did not need to cut things as finely as the USA did with Mercury. 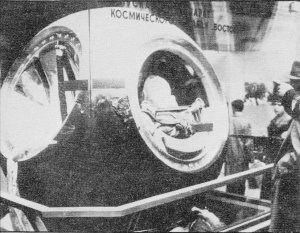 The Soviets could afford the weight of a dual-gas-oxygen and nitrogen - capsule atmosphere, plus enough consumables to permit Vostok to remain in orbit for long periods of time - 64 orbits in the case of Nikolayev in Vostok 3. They even had television transmission from the Vostok. The Vostok capsule is a very strong and rugged vehicle, as evidence by the released photographs. It also came as a great surprise to Western engineers to see from released motion pictures that the Soviets do not use "white room" techniques in the assembly and check-out of the Vostoks. Photos plainly show the Vostok capsules being assembled in huge hangars. The equipment aboard is also very rugged and heavy; a photo shows a coveralled Soviet technician installing some electrical gear with a large 250-watt soldering iron. The Vostok capsule that is placed in orbit consists of 1) the entire top stage of the carrier rocket, 2) a service module carrying electronics, consumables, and re-entry rockets, and 3) a spherical re-entry com­mand module. An aerodynamic shroud protects the spacecraft during launch and perhaps is jettisoned after separation of the top stage from the booster sustainer core. The only thrusters visible on the Vostok spacecraft that have been displayed in Paris, Moscow, and Montreal are the four nozzles located on the aft end of the top stage. These may also be vernier rockets for final orbit adjustment. They appear to be canted slightly to provide roll control as well as pitch and yaw control when operated singly or in pairs. When ready for re-entry, the top stage is jettisoned, revealing the conical-shaped aft end of the service module. This has never been displayed, but is shown in both Czech and Polish drawings. Although its exact shape is therefore open to ques­tion, it must also mount some manner of attitude control thrusters to align the command and service modules for proper re-entry rocket firing angle. The re-entry rocket engine is apparently at the small end of the conical frustum of the service module. After firing of the re-entry retro rocket, the service module is separated from the spherical command module, prob­ably by releasing the straps that go around the command module. The service module thrusters, wherever they are located, may also impart a roll to the command module after it is positioned in the proper re-entry attitude. The command module is a sphere 96" in diameter. 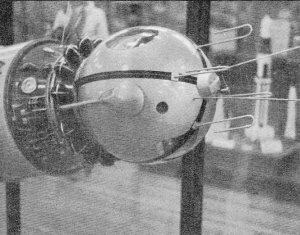 The displayed Vostok had a coating of aluminum foil over the sphere to provide thermal control. Released Soviet photos indicate that the sphere is coated with an ablative heat shield material on the hemisphere at the pilot's back, while the remainder of the sphere is protected with honeycomb material. Early USA manned capsule designs used the spherical shape, but this was later modified to the blunted cone shape now so familiar to us, primarily because the blunted cone shape weighs less. The Soviets stuck to the spherical re-entry shape because: a) they did not have a weight-lifting problem to contend with, and b) the aerodynamic characteristics of a sphere are very well known. In the engineering trade-off between weight and aerodynamic knowledge, the Soviets opted for more weight and a shape they knew more about, thereby shortening their development time period. The Vostok re-entry sphere has an off-set center of gravity to provide some stabili­zation during re-entry. It may also have an imparted roll around its fore-and-aft axis (with respect to its position on the launch vehicle). It apparently has no drogue parachute like our Mercury and Gemini capsules. It comes in like a spinning ball. The spherical shape, with its off-set CG and imparted roll, leads me to believe personally that the Vostok probably un­dergoes more oscillation during re-entry than the US space capsules. Re-entry in a Vostok must be a wild ride! At about 23,000 ft., the cosmonaut ejects from the spherical capsule. The entry-exit hatch blows off, and the three ejection seat rockets fire to push the cosmonaut and his seat clear of the falling capsule. The cosmonaut then separates from his seat and lands under a regular personnel parachute, just like a jet pilot that has ejected from a plane. Soviet films show the Cosmonauts practicing ejection from Yak-25 Flashlight jets. At about 16,000 ft., another hatch blows off the side of the Vostok sphere, the capsule recovery parachute deploys, and the capsule lands. at a velocity of about 33 ft. per second. Although all Vostok cosmonauts used this type of landing system, the Soviets claim that a landing can be made with the cosmonaut remaining inside the capsule. This may be true; in an emergency, the cosmonaut may not have to eject from the capsule. But it is my belief that such a landing would be very rough on a cosmonaut. Why did the Soviets use this recovery technique for their Vostok cosmonauts? In the first place, they recover their capsules over land rather than over water as the U. S. does. Impact forces for a ground landing are much more severe than for a water landing. The geometry of the Vostok sphere shows that the only available free Volume in the sphere for stowage of the capsule parachute is on the side of the sphere. If the cosmonaut stayed inside the capsule, he would have to take the parachute opening shock and a landing shock of 33 ft. per second on his side. So the obvious safe technique was to get the cosmonaut out of the capsule before parachute opening and landing. This also permitted a smaller capsule recovery chute and the high capsule landing velocity. Again, however, we see Soviet engineering philosophy at work here. The cosmonaut is already strapped into an ejection seat which is required for emergency egress during a launch abort. The Soviets did not develop an escape rocket system such as we used on Mercury. They used the ejection seat technique that we later used with Gemini. Apparently, the Soviet engineers decided to use the ejection seat that was incorporated for launch abort purposes in a dual role: launch abort safety as well as simplifying the landing problem. The ejection seat is also obviously intended for launch abort purposes because the capsule's aerodynamic shroud has a large, unfaired opening in it for entry and egress. Although the Vostok spacecraft system may appear to some people to be crude, it is well to remember that it worked quite well. The Soviets got 12 flights with it, in­cluding six completely successful manned missions. They even flew a woman in it. Soviet engineering, as evidenced by their aircraft alone, is eminently pragmatic. Their launch pad technique also shows this. Recently released motion pictures of the check-out, erection, and launch sequences at the Tyuratam Cosmodrome reveals an entirely different system than that in use in the United States for large launch vehicles. The carrier rocket is completely assembled horizontally on a railway car erector inside the Cosmodrome hangar. The Vostok space capsule also undergoes final as­sembly in the hangar and is put through a series of systems tests with and without a cosmonaut aboard before mating the spacecraft to the booster. Finally, the entire carrier rocket and spacecraft is mated horizontally in the hangar. The check-out vehicle is taken by rail on its erector car to the launch pad. It is then erected on the pad by the hydraulically-operated erector, and four counter-weighted steadying and hold-down arms swing in to secure the booster vehicle on the pad in a vertical direction. These hold-down arms also have work platforms attached to them. Two swing-back umbilical towers are also po­sitioned against the vehicle so that propel­lant loading lines, electrical cables, and capsule air conditioning ducts can be attached. After the erector is removed, a rail-mounted service tower with an elevator is moved into position on the erection side of the vehicle. The vehicle itself does not have its base flush with the main surface of the pad, but is positioned with its base below the pad level in a well over the flame pit. There are no assembly operations carried out on the launch pad, but some final systems checks are probably made. Everything appears to be moved in and out of the launch pad area by rail. Either the Soviets have two such pads at Tyuratarn Cosmodrome, or this system of horizontal hangar assembly and rail-borne erection has been designed for an extremely rapid pad turn-around time. 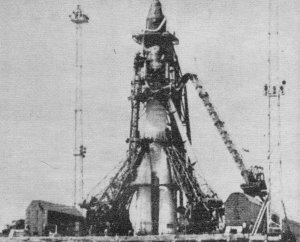 The first Soviet paired flight with Vostok 3 and Vostok 4 required two launches within 24 hours - one on August 11, 1962, and the second on August 12th. It took the U. S. a week of three-shift operation to recycle the launch pad between Gemini 7 and Gemini 6; this long recycle time was due to the fact that the Gemini-Titan vehicle must be assembled in a vertical position on the launch pad before final systems checks can be done. If the Soviets used the same launch pad for their paired Vostok flights, it seems unlikely that the USA can match their pad turn-around time even with the Saturn V Complex 39 or the Titan III complex at Cape Kennedy. Obviously, the Soviets can assemble and check-out two Vostok launch vehicles at the same time with their hori­zontal assembly system. Now that the Soviet Sputnik, Lunik, early interplanetary, and Vostok programs have been reasonably well described by Soviet sources and Western analysts, what about the Soviet multi-man Voskhod follow-on program? Again, we now know from Soviet sources that the standard space carrier rocket was used. This has been called the RD-107B vehicle by some U. S. sources. It utilizes the same 1½-stage booster-sustainer vehicle, but has an uprated, lengthened upper stage that is some 18 ft. longer than the Vostok top stage. 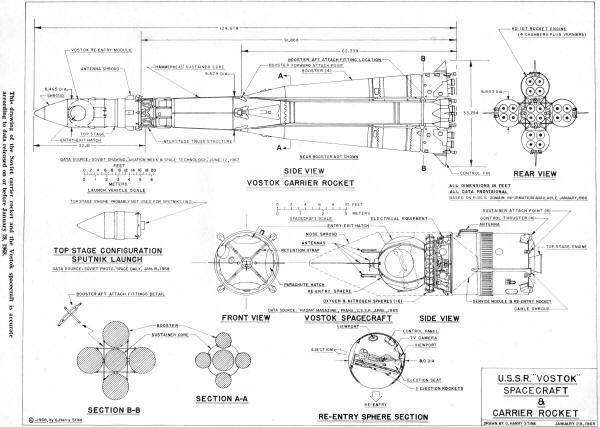 Most of this additional Volume is devoted to additional propellants, and the new top stage may have a multiple-chamber rocket engine in place of the single-chamber engine of the Vostok vehicle. The released photographs at the time of this writing give no information on this point. However, like the Vostok RD- 107 vehicle, the Voskhod RD-107B rocket was used by the Soviets from 1961 on. According to Professor G. V. Petrovich, it has an orbital capability of 14,333 lbs. The Voskhod shroud seems to be the same diameter as the Vostok's, but it is longer. 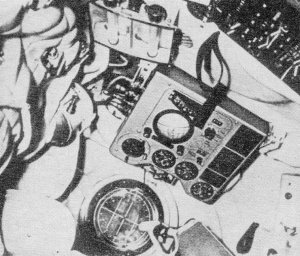 External details of the Voskhod spacecraft itself have not yet been revealed at the time of this writing, but several things can be inferred about Voskhod. It has no ejection seats in evidence. In Voskhod 1, the three cosmonauts Komarov, Yegorov, and Feoktistov flew without pressure suits and landed inside the capsule. On Voskhod 2. Belyayev and Leonov flew in pressure suits as a safeguard against airlock mal­function, the weight of the third crew member being replaced by the collapsible airlock for Leonov's EVA. Again, Voskhod 2 landed with the two cosmonauts aboard. The Soviets have announced that retro-rockets were used in the landing sequence. The simple blackboard drawings of Leonov during the press conference in which he described his EVA indicate that the Voskhod may still be the 96-inch diameter re-entry sphere of the Vostok program but with a canister added on the forward end for a larger landing parachute. 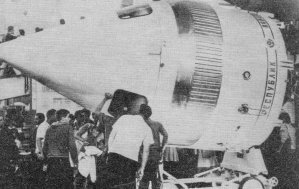 Since the cosmonauts landed in the capsule, it seems reasonable to assume that the Soviets eliminated the side-mounting of the Vostok recovery chute. How and where landing retro-rockets could have been mounted so that they were protected during re-entry remains unknown at this time. Whatever the Soviets have come up with beyond Voskhod is not known yet. Undoubtedly, they have already made several unmanned flights with a much larger car­rier rocket, if the past history of their space program is any indication. Proton 1 was flown on July 16, 1965; its announced weight was 26,840 lbs. in orbit. As displayed in Paris, Proton 1 was 14.76 ft. in diameter. A vehicle of this size and this weight would require a launching vehicle of a size between Saturn-Ib and Saturn-V. The Soviets may have used this new vehicle for the successful Venus shot, and may also have used it for the ill-fated flight of Soyuz 1 on April 24, 1967 during which Komarov lost his life after re-entry. Norman Baker, the editor and publisher of Space Business Daily, remarked to me that the Soyuz booster might be an SS-9 core surrounded by four strap-on SS-9 boosters. The SS-9 is the new Soviet ICBM paraded in Moscow in 1967 and powered by a cluster of six thrust chambers. This would certainly be consistent with the Soviet space vehicle design philosophy evidenced to date. However, all of this must remain speculation until more details are released by the Soviets and until they make their next series of space flights. One thing is certain: The Soviets are going to continue to expand their space program with multi-man flights, orbital rendezvous, and very large launch vehicles. The Moon may not be their immediate goal; a permanent manned orbiting space station may well be in the Soviet space planning instead, and this may be used as a departure point for the Moon and the planets which they are currently engaged in scouting successfully with unmanned spacecraft. The Soviet Union has been aiming toward space flight longer and more consistently than the United States. It would be folly to believe that they would not continue the pace of their program regardless of what the United States does.